Good morning. Gosh, I must have been wicked tired lately. Last night I went to bed right after supper and fell asleep until the phone woke me up. I thought I had slept right through till morning, but the caller assured me that it was only 7:30 in the evening. It was a short call, and I went right back to sleep until 4:30 this morning. I got up and made breakfast for Pogo and me, and then I went right back to bed and slept till 9:30 a.m.
Well, yesterday I made some more headway with some of my chores around here. Plus I put out two more bags in the recycle bin. Today I'll pick a spot and see what I can do to change it around a bit. Other than that, I think I'll take it a bit easy today. 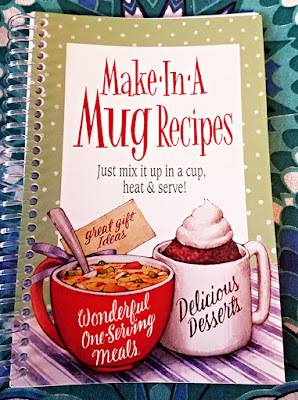 The other day, I picked up a recipe book called "Make In A Mug Recipes." I was rather curious about what sort of things you could make in a mug. It turns out that you can make quite a lot of different things this way. Here's just one of the recipes in this book. Pancake In A Mug. Directions: Spray a large mug with non-stick cooking spray. Mix the first three ingredients in a small bowl and then pour into the mug. Cook in a microwave for 1-2 minutes (depending on the strength of the microwave) or until done. Using a wooden skewer, poke holes in the hot pancake and pour the butter and syrup over the top until saturated. Enjoy. There are other tasty recipes such as Italian Sausage Soup, Classic Tuna Casserole, Tetrazzini In A Mug, Double Cheeseburger Slider and Key Lime Mug Pie just to name a few. Last year while I was out shopping, I bought a hat that I thought my daughter Audrey would love. However, I forgot to sent it to her. I must have set it aside, and then forgot about it. Last week I found it, so I put in a small package and mailed it to her. Audrey loves the Grinch. When she got the package, she sent me this photo. It guess she has a sense of humor too! It's a bit warmer today. At the moment it is 57F degrees, but will be in the low seventies in another hour or so. Gosh, I hope it stays nice like this right into November. I know, I'm a dreamer. Last night I cooked my little guy a steak for his supper. He ate half of it, and he's enjoying the other half right now. I buy the cubed steak because it is easier for me to cut it up small. Plus it's quite tasty. Deanne might be coming by today with her grandbaby Aurora. Gosh, I hope they can make it. It will be so nice to see the baby. She'll be two in February. Wow, where is the time going? Well, I think I need to get moving here. The morning is almost gone and I haven't started on anything yet. I still have to decide what to make for supper tonight. DIL Janet will be coming by after work. I'll have to see what's in the freezer. Ah well, that's my news for this morning. So, till tomorrow, Y'all have an awesome day. 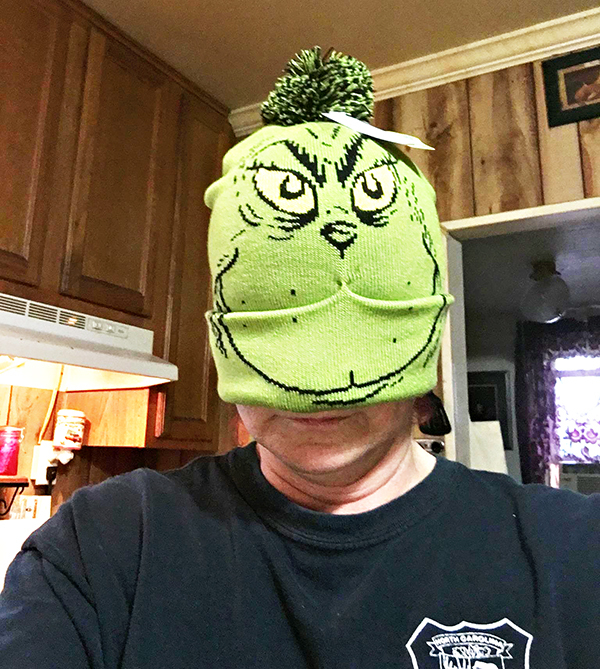 I love the Grinch hat and I think that Audrey must love it too. How fun!!!! I also like the Recipe In A Mug book too. It looks like a lot of goodness in a mug. Sleep is a good thing. I wish that I could have gotten a bit more. It was almost 3:00 this morning before I could stop coughing and get a bit of rest. It seemed that every time I got comfortable I would start hacking. I guess the steroids are breaking everything up.